Thank you, Chairman Goodlatte and Ranking Member Conyers for the opportunity to testify on the state of immigration law enforcement and how it might be improved. Currently, immigration law enforcement is in a state of collapse. The vast majority of illegal aliens face no threat of deportation (regardless of when or how they arrived); new illegal arrivals continue from land, air, and sea; and the size of the illegal population stopped declining several years ago. The Obama administration's deliberate dismantling of enforcement has imposed enormous costs on American communities in the form of lost job opportunities and stagnant wages for native workers, higher tax bills to cover increasing outlays for social services and benefits, compromised national security, and needless public safety threats. One of the most urgent tasks now before Congress is to restore integrity to our immigration laws by ending the massive catch and release scheme put in place by the Obama administration, implementing more effective deterrents to illegal settlement, and providing the tools for more efficient enforcement. Dramatic Decline in Enforcement Statistics published by the Department of Homeland Security (DHS) show clearly that over the last several years, even as illegal border crossings have grown and the number of overstaying visitors is large, the number of deportations has plummeted and the number of illegal aliens allowed to stay and work in the United States has increased. The drop in enforcement activity has become particularly acute since the president's executive action went into effect in late November 2014. Border Crossing Attempts. Since 2011, the number of illegal crossers apprehended by the Border Patrol has increased by 43 percent, from 340,000 to 487,000.1 It is generally believed that border apprehensions are an indicator of the number of attempted illegal border crossings, and that approximately half of those who attempt illegal entry are successful. U.S. Customs and Border Protection (CBP) states that "The uptick is largely due to the increase in unaccompanied children and family units who turned themselves in to Border Patrol agents in South Texas this summer." These cases totaled 137,000 in 2014 alone. 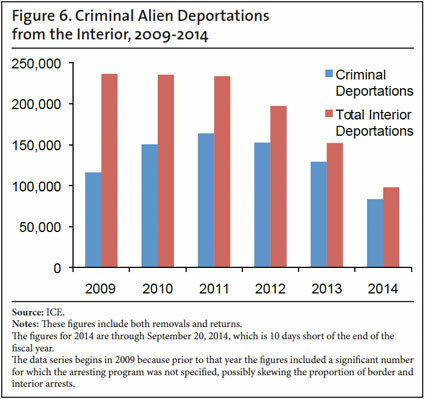 Criminal Deportations. The number of criminal aliens deported from the interior has declined by 43 percent since 2012, from 153,000 to 87,000, despite increases in the number of criminal aliens encountered and screened by officers. 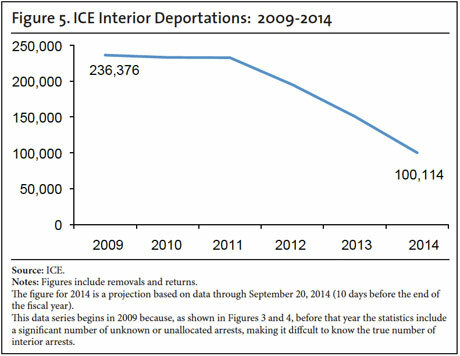 In 2014, ICE deported 69,000 fewer criminals from U.S. communities than it did in 2012. This has occurred despite the fact that ICE has the ability to identify more criminal aliens than ever before, thanks to the nationwide implementation of the Secure Communities program, which links the DHS databases to the national fingerprint matching system. Moreover, many convicted criminal aliens are allowed to walk out of ICE custody without being enrolled in a program of supervision. For example, ICE officer report that fewer aliens are being enrolled in the Intensive Supervision Appearance Program (ISAP), in which criminal aliens wear an electronic monitoring bracelet and check in frequently with monitors. I am told that while once this program was used frequently for lower level offenders, now it is rarely used, in favor of allowing the criminal alien to bond out without supervision. Members of this committee may wish to ask ICE to disclose how frequently this program is being used to supervise criminal aliens after release, which type of aliens are required to participate compared with prior years, and how many of these aliens have re-offended. ICE officers also report that informants who once agreed to work for ICE to help dismantle major gang conspiracies in exchange for the ability to stay here now are telling ICE that they have no incentive to do so, because they qualify for the president's amnesty or know that they can take advantage of "prosecutorial discretion" policies. One gang investigator told me that some illegal alien gang members actually taunt ICE agents, knowing they are now virtually untouchable for deportation. ICE officers have told me that since the administration's policies of prosecutorial discretion were expanded, they are processing a small fraction of the number of aliens that they used to process. One recently told me that his office used to process as many as 100 aliens per day, but since the president's executive actions went into effect, now they are processing closer to five aliens per day, with the same staff and budget — meaning the government is spending perhaps 20 times more in resources to deport each alien as was the case before. This reality suggests that the president's executive actions were less about prioritizing resources and more about protecting illegal aliens. The Non-Departed. The number of aliens who have received a final order of removal, but who are still in the United States, has risen to nearly 900,000 as of September 2014.13 This number has grown by 40,000 in just two years. Part of the reason is that, even with the administration's mass dismissals of "non-priority" cases in lieu of immigration hearings, many of the aliens whose case are completed and who are ordered removed simply do not comply if they are not detained. They were never a priority for enforcement under this administration, but now the president's recent executive action specifically nullified all removal orders and enforcement actions involving "non-criminals" taken before January 1, 2014. Legal Action. One factor behind the erosion of enforcement has been a steady stream of predatory law suits aimed at obstructing ICE from doing its job. The administration has contributed to the success of these lawsuits by declining to challenge them; offering prompt settlements; withholding assistance from local enforcement partners; and issuing controversial policy statements, sometimes without sound legal foundation, that can be used by plaintiffs hostile to the government's mission. If one were to think of immigration litigation against the government and its enforcement partners as a game, then the Obama administration is throwing it. One prime example is ICE's abandonment of detainers as an enforcement tool — a perfectly legitimate, lawful tool that not only helps ICE do its important job, but protects the public and ICE officers as well. The administration is pretending that it abandoned this tool because of unfavorable court rulings, but in fact top agency leaders initiated dubious policy statements that were simply accepted by the courts — leaving ICE's local law enforcement partners who had cooperated in good faith (and in compliance with actual federal regulations) twisting in the wind and subject to significant legal and financial liability.14 The final nail in the coffin came in one of the November 2014 executive action memos declaring the "end of Secure Communities" by prohibiting ICE officers from issuing detainers in all but rare cases. Failure to Enforce REAL ID Provisions. According to documents leaked by a Transportation Security Administration (TSA) whistleblower, illegal aliens who have been issued a state driving privilege card are permitted to use the card for federal purposes such as boarding an airplane. This policy makes life more convenient for illegal aliens and anyone fraudulently obtaining one of these cards, but is a flagrant disregard of the REAL ID Act, and poses a serious risk to security for the public. Dismantling Worksite Enforcement and Fraud Control. Successful programs to address illegal employment (the main magnet for illegal immigration), identity theft, and benefits fraud have been de-prioritized and starved of resources, nearly to extinction. This ensures that those who make it past the Border Patrol or through visa controls can work illegally, steal identities, use false documents, make false claims, avoid taxes, collect social services, and commit traffic offenses, all without much fear of punishment or removal. There is no more powerful incentive for people to keep trying to come here illegally than the realistic understanding that you will be allowed to stay and that the crimes and infractions committed in connection with your illegal status will be ignored. Moreover, without meaningful worksite enforcement, there is no incentive for employers to maintain a legal workforce, and they will continue to hire illegal workers. Issuance of Work Permits. In addition to suspending enforcement against all but the most egregious violators, the Obama administration has egregiously abused its ability to issue work permits. According to USCIS records, from 2009 to 2014, the agency issued 5,461,568 new work permits to aliens — these are work permits issued in addition to legal immigrant and guest worker admissions. Of these 5.5 million new work permits, more than three million were issued to illegal aliens and aliens admitted on temporary business, tourist, visa waiver, or student visa statuses that do not allow employment. Included among the three million new work permit holders are many aliens who do not qualify for any legal status and are in deportation proceedings. This includes aliens who were arrested by ICE, but released on an order of supervision; aliens seeking suspension of deportation or a stay of removal; criminal and non-criminal aliens ordered removed, but whose countries will not take them back; asylum applicants; and illegal aliens granted parole into the country after arriving from Central America in the border surge of 2012-14. Katerin Gomez, age 35 and mother of three children under age 13, was killed in Chelsea, Mass., on October 18, 2014, by a stray bullet through her window. The gun was fired during a street brawl allegedly by Hector Ramires, a 21-year old illegal alien member of the notoriously violent MS-13 gang, who was at large awaiting trial for two prior arrests for armed robbery (one with a gun, one with a knife), in which his illegal status and gang membership were noted. The police report also includes mention of prior criminal involvement in his home country of Honduras. ICE did not issue a detainer nor initiate deportation proceedings after either prior arrest, nor did it make an effort to charge Ramires as an illegal alien in possession of a firearm, which is a felony punishable by up to 10 years in prison. Grant Ronnebeck, age 21, was killed while working at a convenience store in Mesa, Ariz., on January 22, 2015. The accused is Apolinar Altamirano, one of the 36,007 convicted criminals freed by ICE in 2013. Altamirano had a gang and drug-related felony burglary conviction, but was released by ICE without supervision to await an immigration court hearing, still pending after two years. Magno Sosa, age 32, was shot twice in the head and killed on January 17, 2015, in Everett, Mass. The accused is Rigoberto Escobar, an illegal alien who was out on pretrial probation for assault and battery with a dangerous weapon and assault and battery on a police officer. Again, ICE had declined to issue a detainer or pursue immigration charges after the assault and battery arrests, most likely because of policies forbidding officers from initiating charges on illegal aliens who have not yet been convicted. Numerous reports show that illegal aliens who are released back into the community instead of detained for prompt removal have a high likelihood of re-offending. Senior ICE officials have told me that about 50 percent of arrested aliens freed from ICE custody or freed by local law enforcement agencies in defiance of detainers have re-offended. Prevent illegal employment with a phased-in universal E-Verify mandate and other measures to boost employer compliance and address identity theft. Provide funding for an increase in detention capacity for immigration enforcement agencies and require that DHS use it for that purpose. Clarify ICE's authority to use accelerated forms of due process, especially for recent border crossers and criminal aliens, in order to relieve pressure on the immigration courts. Revise the fee collection and expenditure process for USCIS to prevent the use of fees paid by legal immigrants and sponsors for any purpose not specifically authorized by Congress. This would prevent the executive branch from diverting immigrants' fees away from the legal processing system and anti-fraud efforts. 1 John F. Simanski, "Immigration Enforcement Actions: 2013", Department of Homeland Security, and the "CBP Border Security Report, Fiscal Year 2014," published by U.S. Customs and Border Protection. 2 Testimony of Jessica M. Vaughan, House Immigration subcommittee, December 10, 2014. 3 Department of Homeland Security, "Nonimmigrant Overstays: Fiscal Year 2012," unpublished report reviewed by author. 4 Source is a database of all ICE removals in 2013 obtained through a FOIA request, using the Entry Status classification, and includes all those labeled non-immigrants, Border Crossing Card holders, temporary workers, students, and other temporary categories of admission. 5 DHS Office of Immigration Statistics yearbooks and annual reports. 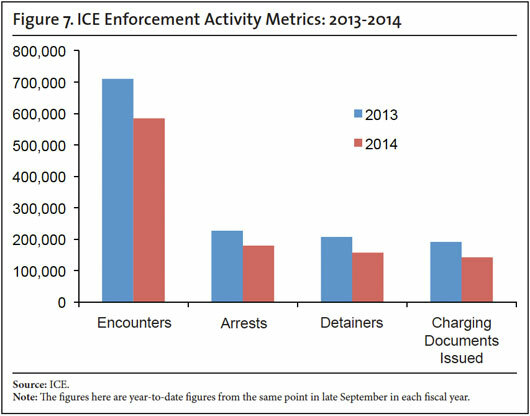 6 Jessica M. Vaughan, "ICE Enforcement Collapses Further in 2014", Center for Immigration Studies, October 2014..
7 Jessica M. Vaughan, "ICE Document Details 36,007 Criminal Alien Releases in 2013", Center for Immigration Studies, May 2014. 8 DHS records provided to Sen. Chuck Grassley, released on January 30, 2015. 9 Testimony of DHS Secretary Jeh Johnson before the House Homeland Security Committee on December 2, 2014. 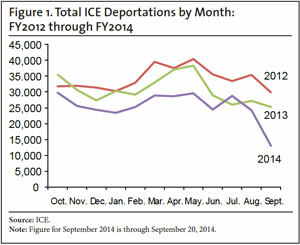 10 ICE Weekly Departures and Detention Report, September 22, 2014. 11Source is ICE records obtained by the author through a FOIA request. 14 See Dan Cadman and Mark H. Metcalf, "Disabling Detainers: How the Obama administration has trashed a key immigration enforcement tool", Center for Immigration Studies, January 2015. 15 Devlin Barrett, "U.S. Delays Thousands of Immigration Hearings By Nearly Five Years", the Wall St. Journal, January 28, 2015.